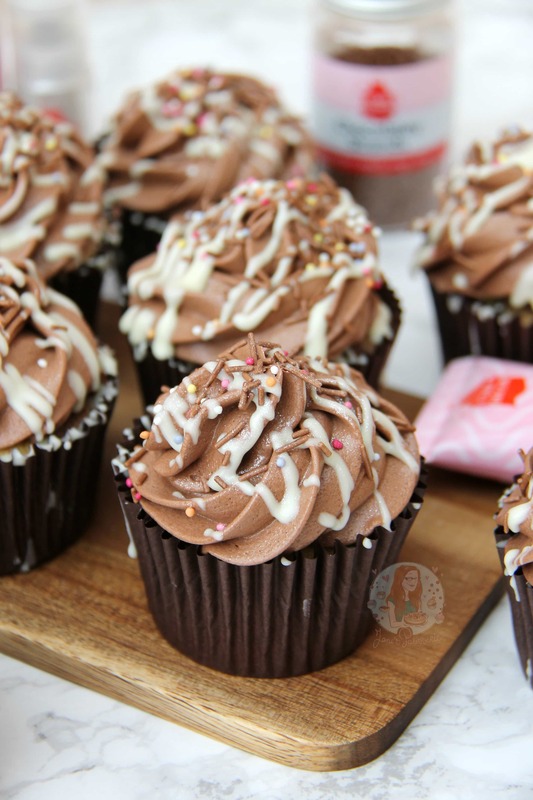 Oh hellooooo Chocolate & Vanilla Marbled Cupcakes topped with Swirled and delicious Chocolate Frosting. Oh my days. 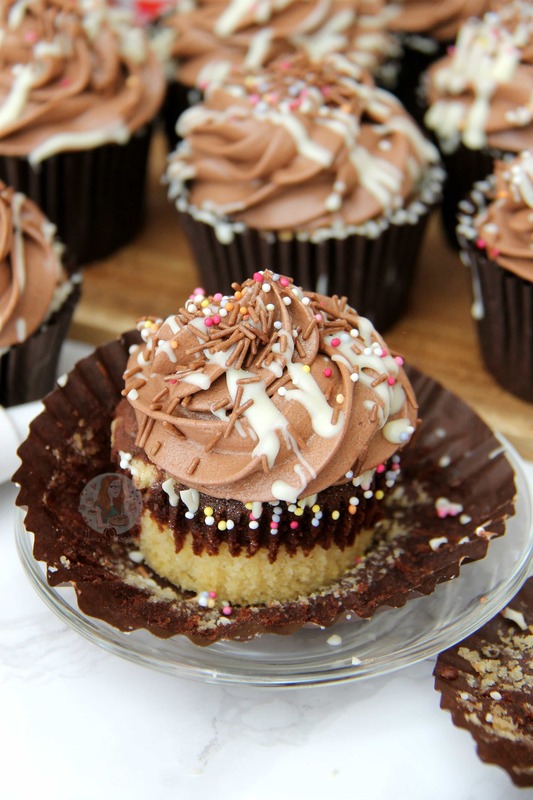 I love a marble cake, but in cupcake form? I feel sliiiightly less guilty in having it compared to a chunk of an entire cake. I went for Chocolate and Vanilla as they are staple cake flavours, but you can pretty much marble any cake flavours you like! 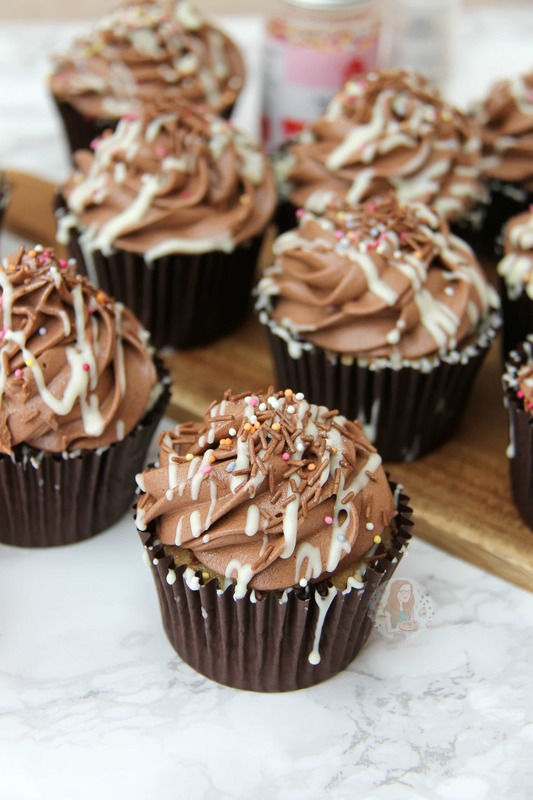 I based these on my Chocolate Cupcakes and Easy Vanilla Cupcakes as they’re so easy and yum. 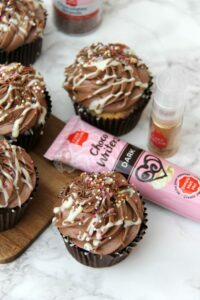 I used a simple frosting recipe such as from my Chocolate Cupcakes recipe, but you could easily do half vanilla or colour half to the colour you like and then pipe away! I used some decorations from Cake Décor and they were so pretty! The lovelies over at Cake Décor sent me over a mini little hamper of their goodies ((which are now available in a few stores such as Asda, Sainsburys & Morrisons)) after they set up their ‘Bake It Beautiful’ Campaign. The idea of #BakeItBeautiful is that you can easily bake something delicious with ease, and it’ll still look fantastic. Their campaign is based around 7 different weeks, each week having a new theme, and changing on Wednesdays to coincide with a new GBBO episode! 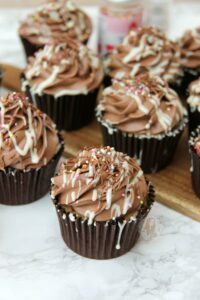 So far they have had Icing, Sprinkles, Lace and Biscuit weeks, and at the moment its Cupcake Week so I thought this would be the ideal time to post my Marble Cupcake recipe using some of their cute and delicious products! In the little hamper I got some Roll out Icing, Sprinkles, a Lace Kit, some Glitter Sprays, some Choco-Writers, some Two-Tone Icing Tubes and more! I struggled to know what to use first! I am not saying this just to sell their products, as I wasn’t paid for this, I just received the products to try out and get involved with the campaign. I thought that doing a post during their Cupcake week would be perfect as I have been wanting to post my Marble Cupcake recipe for a while, and this gave me a chance to use a good few of Cake Décor‘s products in one hit! 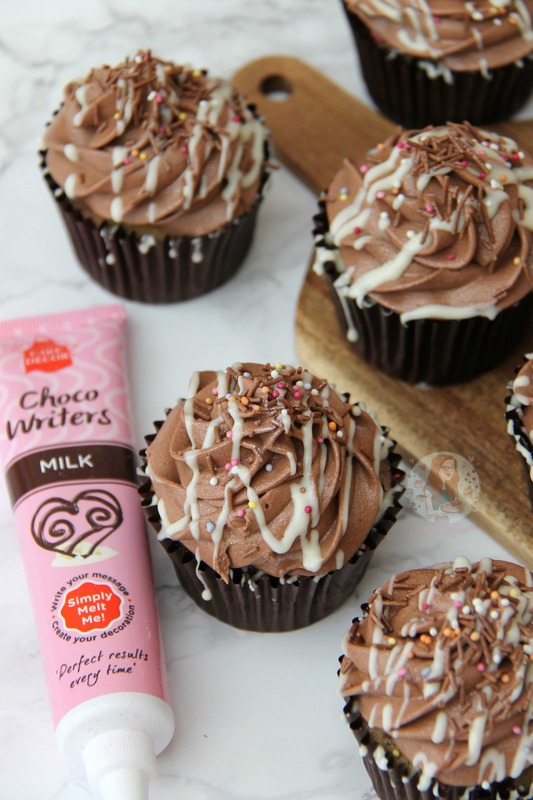 I ended up using one of their Choco-Writer tubes to drizzle the chocolate onto the cupcakes, they’re chocolate sprinkles and hundreds & thousands, and then their silver glitter spray as well! I have tried a few of the other products from Cake Décor from the package and they were all lovely. The only one I couldn’t really get on with was the Two-Tone/Colour frosting tubes as I just don’t think the packaging makes it very easy to use and there isn’t much in each tube honestly, but the idea behind it is really lovely, and the frosting tastes nice so for mini cupcakes they’d be great. On the other hand though, the sprinkles are lovely, the lace kit is so cute, and I adored the glitter sprays as it makes life so much easier! 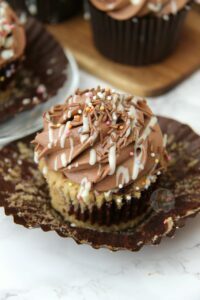 As I say, you can use whatever sprinkles you like, and you can just use melted chocolate to drizzle on the cupcakes, but I thought trying out the new products would be a good idea. 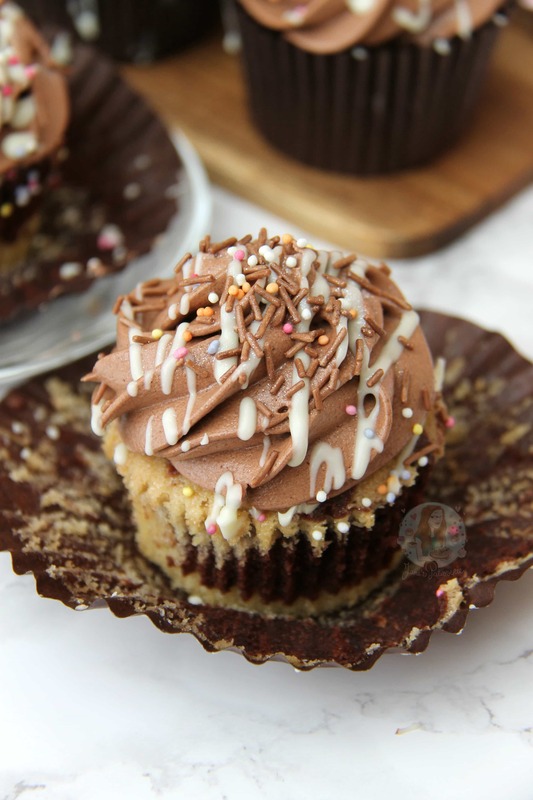 I hope you guys love these cupcakes as much as I do – Enjoy! 2) Cream together the Butter and Caster Sugar with an electric beater till smooth – add in the Beaten Eggs and Flour and beat again for about about 20-30 seconds on a Medium Speed till combined. 3) Split the mixture between two bowls and add the vanilla to one half, and the cocoa powder to the other and beat each again till smooth. Once combined it might still be a little stiff, so loosen with the Whole Milk, about 2 tbsps each! 4) Spoon small spoonfuls randomly into your Cases to create a marble effect until they’re about 2/3 full and Bake in the oven for 18-20 minutes or until cooked through! Leave to cool on a wire rack. 5) Once the cakes are cool, decorate! Beat the butter for a couple of minutes until really smooth and light – add in the Icing Sugar one half at a time and beat in-between each addition. Add in the cocoa powder and beat together till smooth and fluffy (takes about 3-4 minutes). 6) Once finished, pipe your buttercream onto the cupcakes using your favourite tip – I used a Large Star! Melt the Choco Writer in a jug of boiling water for 3 minutes so its melted and easy to drizzle out of the tube (or melt 50g White Chocolate and drizzle over that way!) Sprinkle on your favourite sprinkles, and dust with some edible glitter! You can easily make a two-tone frosting if you wished to make it even more marble, as I have written above in the blurb, but I went for all chocolate as I was craving chocolate frosting and it didn’t disappoint. Older Next post: No-Bake Mars Bar Cheesecake! Newer Previous post: No-Bake Triple Chocolate Cheesecake! As always, your baked goods look devine! 🙂 Mouthwatering, haha.